Uzi 16.5" 9MM Barrel Threaded. These barrels fit all full size semi auto 9mm Uzi (Model A & B ) Century Arms UC-9, Vector, Action arms, Norinco, Group industries, etc. 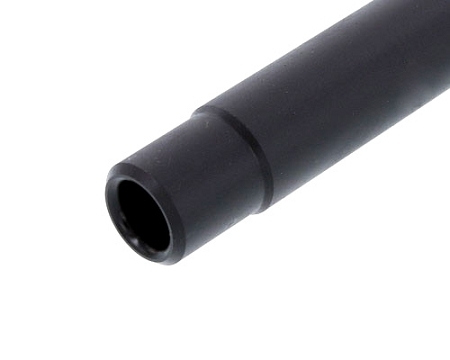 Made from 4150 chrome moly steel, button rifled, 1:10 twist, threaded 1/2-28 with black phosphate coating ..
Chambered for more reliable feeding.REMEMBER this is a 9mm barrel . Do not install a smaller caliber flash hider or other accessory. Fit and finish is outstanding.Gun runs flawless now.Great company to buy from.Keep up the good work. The part arrived promptly and was well packaged. The barrel is very well made and fits perfectly.